LIMITED TO 20 SEATS ONLY! Get the new Small Blog, Big Income e-book FREE when you join this mastermind! I was a longtime freelance writer before starting my Make a Living Writing blog in late 2008. By 2010, it began to earn for me, and by 2011, it cracked six figures. 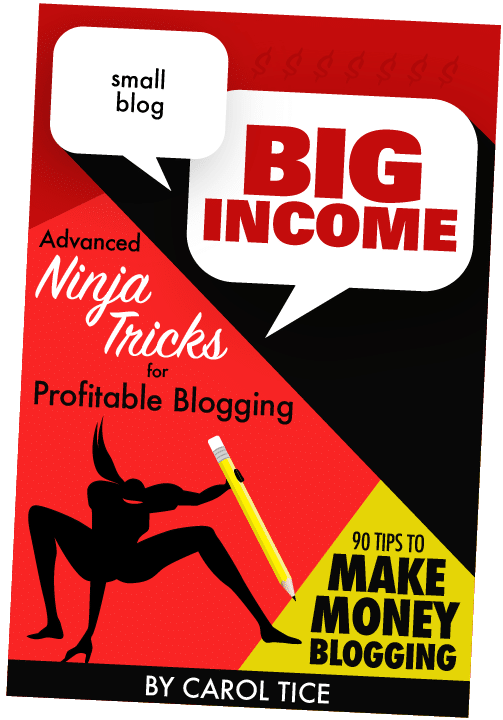 I share all the secrets and best practices I learned over years of trial-and-error for earning well from a small, niche blog in Small Blog, Big Income: Ninja Tricks for Profitable Blogging. 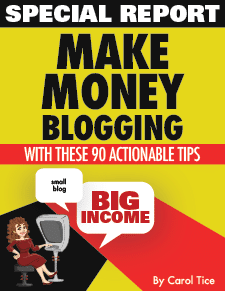 "Dispels the myths small bloggers are prey to." "Better than a $2,400 class!" It took me years — and a TON of mistakes — to learn how to leverage my blog platform into a major money-maker. You don't have to waste the time I did, doing everything wrong off the bat — you can grab SMALL BLOG, BIG INCOME: Ninja Tricks and its Special Report. Stop making pennies with your blog and learn how to make it pay all your bills, and give you the lifestyle you want. and we'll send it out to you, along with the special report, as soon as it's ready. Go From Earning Pin Money to Earning BIG Money With Your Blog! Wish you could figure out how to make serious money from your blog? Well, good news—in my soon-to-be-released e-book Small Blog, Big Income: Advanced Ninja Tricks for Profitable Blogging, I reveal all the fine points of how to explode sales—even when you only have a small blog audience. Big blog gurus have advice that works great—if you've already got a ton of subscribers and traffic. BUT...That's not most of us! And that's why I wrote the original Small Blog, Big Income e-book and shared my 7-Step Formula to creating a blog with real earning potential. In the upcoming sequel e-book—Small Blog, Big Income: Advanced Ninja Tricks for Profitable Blogging—I take you further, and share the exact strategies I used to go from earning a little to earning $500,000 with my blog. Why should you reserve a presale copy now? I've got a special presale price for you, as a previous purchaser of the original Small Blog, Big Income e-book—just $1.99! The price will be higher when this e-book debuts later this month. This site is also the only place where you'll get the useful companion bonus report right when you buy: Make Money Blogging With These 90 Actionable Tips. No need to wonder what's covered inside this new Small Blog, Big Income: Ninja Tricks e-book—you can download the table of contents and introduction and see for yourself!